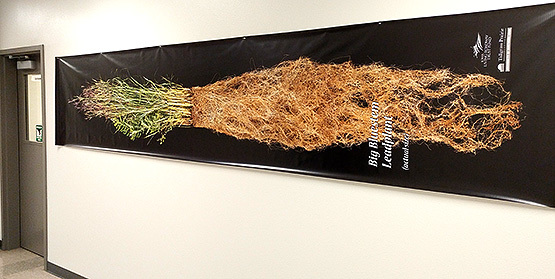 We do a lot of talking about the benefits of prairie roots, but almost nothing we say makes as big an impact as this banner. 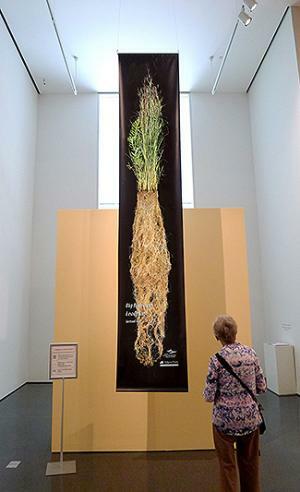 The actual-size image of a Big Bluestem and Leadplant root system evokes awe whenever the banner is unfurled, reinforcing our message about the ecological services prairie roots provide. 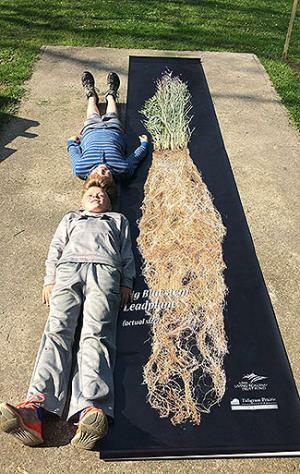 These popular banners are already in use in schools and conservation facilities throughout the Tallgrass Prairie region. They’re a great resource to use with our prairie roots lesson plans, and enhance any prairie education effort. Take a closer look at the image used for the banner here. The banner is 32” wide by almost 14’ long. When not in use, the banner rolls up and can be easily stored/transported in a poster tube. A limited supply of banners is available for purchase. Contact staci.mueller@uni.edu to order. $155 (s/h included) when shipped within the U.S.